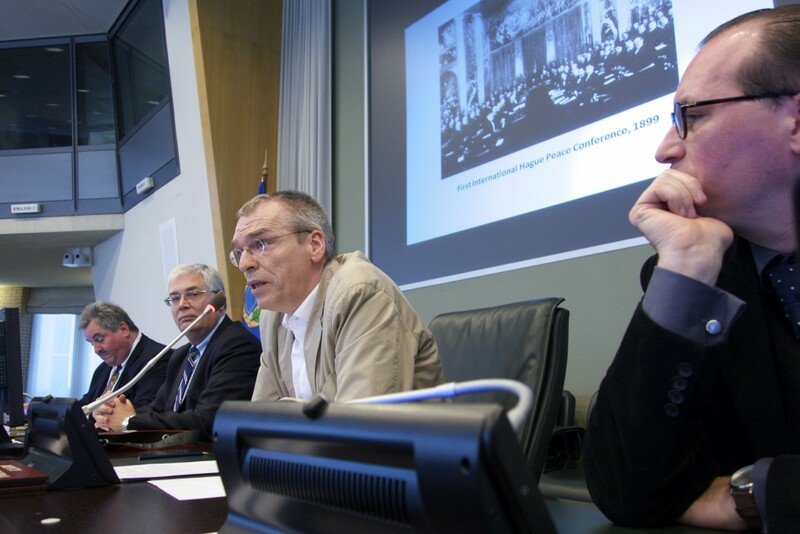 First of all, I want to thank the OPCW for giving me the opportunity to present a short speech here. For years I organized a course on War and Medicine at the VU-university Medical Centre in Amsterdam, and every year someone of the OPCW was so kind to give a lecture on chemical weaponry. Standing here feels as being able to return these favours just a tiny bit. Secondly I want to thank Jean Pascal Zanders for asking me. It gives me the opportunity to congratulate him publicly for getting Innocence Slaughtered finished at last. It is now a hundred years since the first gas attack, in April 1915, and I vividly remember the conference about it, commemorating its 90th birthday. Jean Pascal has asked me to say something about gas, gas victims and the debate on chemical weapons during the Inter War years. First of all because as a Dutchman it would be rather cheap to get me here. But of course mainly because of my expertise on the subject as co-author of one of the articles, the only one concerned with neutrality and gas warfare, and as the author of a book on suffering, dying and military medicine during the First World War, titled: Before my Helpless Sight, or in Dutch: Zacht en Eervol. Lijden en sterven in de Grote Oorlog. The title of the book, Innocence Slaughtered – the same as the conference 10 years ago – is well chosen because we all immediately relate to what it refers too. In April 1915 for the first time a non-discriminatory weapon of mass destruction polluted the fields of battle. Warfare would never be the same again. The ‘fields of honour’ were turned into fields of dishonour. All those who viewed war as a game, on which the rules of fair sports applied, in spite of being a bit bloodier and deadlier, were infuriated. The innocence of warfare, so they said, had been slaughtered. It did not stop the British by the way, to kick footballs into No Man’s Land at the battles of Loos and Somme. If innocence indeed had been slaughtered, if war indeed had stopped to be soccer, it took a while for the message to sink in. However, had indeed innocence been slaughtered? Both the word ‘innocence’ and the word ‘slaughtered’ raise questions. To name but a few among a vast amount of examples, had innocence not already, and literally, been slaughtered when ‘our’ Jan Pieterszoon Coen had the entire population of the Banda islands massacred some centuries earlier? Had innocence not been slaughtered at Wounded Knee when dancing Native Americans were shot like sitting ducks? And if the gas attack at Ypres is to be called ‘innocence slaughtered’ then how on earth should we call the bombings of Hiroshima and Nagasaki one world war later? With such questions we enter my profession. As a historian I always wonder what is hindsight projection and how at the time itself certain phenomena were looked upon. It leads to remarkable discrepancies. Nowadays we generally look upon the Great War as a war of poison gas and shell shock. Actually it was a war of artillery, machine gun and often horrifying physical wounds. No matter how many soldiers at some point or another failed to psychologically cope with the horrors of warfare – speaking of hindsight projection, by the way – their numbers were next to nothing compared with those who were wounded or killed as a result of bullets and grenades. Poison gas caused about 100.000 dead. Indeed, a massive figure, but nonetheless only 1 percent of the total. 99% of the dead in World War I fell victim to what we now call conventional weaponry, ‘normal’ weaponry, similar to the thought that the Kalashnikov has turned out to be the one true weapon of mass destruction after World War II, as was proven once again at Paris in November. Poison gas, as this other chemical horror, the flame thrower, certainly had an enormous psychological effect. It was, however, by no means a weapon of mass destruction, a term invented after 1945 to downgrade the enormous devastating effect of nuclear weapons by putting them in the same category as chemical weapons or weaponized bacteria and viruses. This can be seen in the reactions on gas warfare at the time itself. During the war it was the breaking of unwritten rules of warfare that caused most abhorrence, not the deadly or life lasting health effects. Gas was not a straightforward weapon, but a silent, treacherous, cowardly assassin. This view, however, was anything but generally shared. Many military men welcomed gas as yet another weapon that could bring victory closer. They did not wonder about morals but only thought about the way it could be best employed strategically and tactically. Pacifists, on the other hand, saw it as a logical outcome of capitalism and militarism. They kept on focusing on the underlying causes and not on the consequences; on war against war itself, and not on certain types of weaponry. This was more or less subscribed by Henri Barbusse in his novel Le Feu. After a soldier had aired his outrage about chemicals, another one replied that he did not understand why it would be more horrible to choke to death as a result of gas than to bleed to death because a shell splinter had cut your belly to pieces. In the Netherlands outrage was seen in poems and cartoons, but it was not reflected in the military or government. The latter had to keep up neutrality; the former too, but only partly: the military also viewed chemical weaponry as a natural outcome of warfare and growing technological knowledge. Gas wasn’t good, gas wasn’t bad, gas just was. The attitude of the Geneva International Committee of the Red Cross was at first comparable with the one of the Dutch government, but at the end of the war it nevertheless filed a complaint. In its eyes chemical weapons also broke the rules of war. War had to be a contest of one army against another, if possible only armed with bows and swords, and may the best army win. Both warring sides accused the Committee of breaking neutrality and supporting the other side, resulting in even greater Red Cross’ reluctance to speak publicly on political matters for decades to come. If Britain, Germany and others had not reacted to the Red Cross complaint with rage but with shame, maybe the reports the Geneva Committee wrote on German camps in World War II would have been more courageous. Nevertheless, in 1925 an agreement was set up to ban the use of gas from the battlefields, in a hopeless attempt to turn them back into the fields of honour they allegedly had been before April 1915. But this is but one side of the story. A part of the pacifist movement had now recognized gas as a weapon to be used to proof the godliness, the distastefulness of warfare, as half a century later some American psychiatrists recognized the psychological problems of returned veterans as a useful tool against the Vietnam war. As Dutch cartoonist Albert Hahn had already done during the war, pacifists now looked upon the gas mask not anymore as a tool for protection but as proof gas had dehumanized war once and for all, for the mask took away the only thing a soldier still could call his own: his face. However, the other side of the coin was that militarists began to argue in favour of gas warfare, trying as hard as they could to diminish the effects of the 1925-treaty and interpreting its rules in a way that gas still could be produced and preparation on future gas warfare – necessary of course only for protection against an untrustworthy ‘other’ – could continue. Typical is that ten years after the Geneva committee had protested against gas, the Dutch Red Cross full-heartedly supported this stand. It was defended exactly by pointing to the rather low loss of life gas had caused during the war. A war solely waged with gas, would not be devastating, would not be horrendous, but would in fact be the most humane kind of war imaginable. As a consequence, the debate on gas was more furious at the end of the 1920s than it had been during or in the first years after the war. This sounds strange to our ears, but is this correct? A belated discussion is not a rare thing at all. The debate on the Shoah too did not not take off before the 1960s. But more importantly, also the downgrading of gas effects – who were, by the way, grossly exaggerated by the pacifist movement – is not as strange as it looks. Related to nuclear weapons, gas is a minor horror. But nevertheless it was the president of a country with a vast amount of nuclear weapons who gave the order to invade a country on the pretence that it had chemical weapons. There was a fierce debate on how sensible this action was, but few made remarks on the apparent discrepancy. Not long ago his successor stated that he would militarily attack Assad’s Syria if it was to use chemical weapons. Now almost everyone agreed. The war itself was horrible enough, but chemicals were supposed to be something else altogether. Generally, people are nowadays outraged if gas is used, as if still the notion exists that war should be soccer. To be absolutely clear, I too think this outrage is justified. But nevertheless the contradiction between this distaste for gas and the way we talk about ‘conventional’ weapons is striking, and this goes even more for nuclear weapons, unless a state considered hostile, a state seen as ‘the other’, is allegedly developing one. In the First World War gas was used for three and a half years. In the Second World War nukes were used only twice. But Little Boy and Fat Man produced almost the same percentage of dead and in exact terms about 2,5 times as much. So we have to ask ourselves not only why the use of poison gas is defined as ‘innocence slaughtered’. We have to wonder why nowadays we are so concerned about its use and why we immediately define those who use it as the modern archetypes of evil. And last but not least: we have to ask ourselves why it is seen as normal that, as cluster bombs or biological weapons, gas is prohibited, but nuclear weapons are not, a prohibition nowadays supported by several medical organisations because after a nuclear explosion every form of medical aid is impossible. Among them not only the World Medical Association, but even the Red Cross. I hope their actions will be successful, so one day we will have a gathering like this one, hosted by the Organisation for the Prohibition of Nuclear Weapons.